We, too, it seems are creatures of scent and smell, urge and impulse. What of that place where presence and absence are made one? Word presses against nothingness, rock against rock, one against another. Where nothing was once now is. 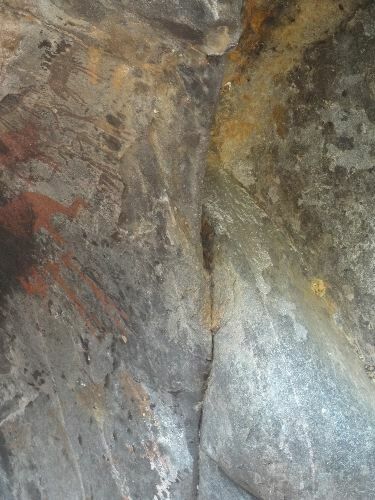 In the rock art of the San, the rock’s seam is thought to be a portal to the spirit world. Ancestors visit as wildebeests, “mythic woman” as elephant and crouching expectant. Black figures prod a red rain animal. Humans enter the fissure and return winged. Tonight, again, tracking the fence that separates the neighboring property — a private reserve and hunting grounds. 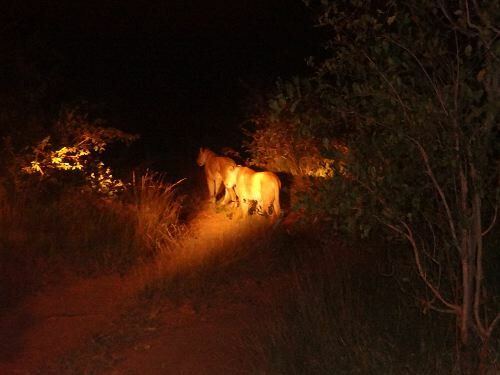 Last night, two lionesses in the road stare across the fence at what looks like nothingness. 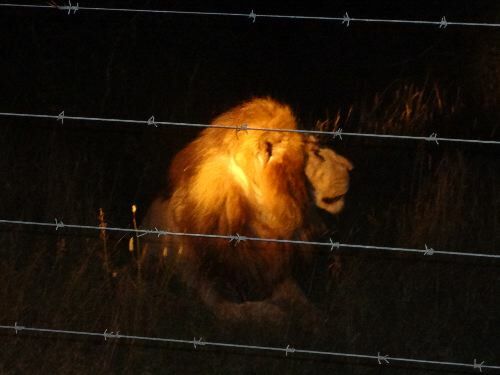 Tonight, what they yearn for — the lion, sleeping across the other side of the fence. The lionesses visit the fence regularly, six months now according to the ranger. At 10,000 hectares the fenced farm supports no more than a small pride. The fence stops the animals, but not the scent that compels them to one another. 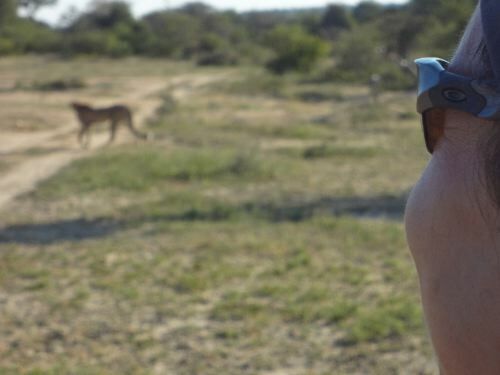 Jonathan Kingdon — author of The Kingdon Pocket Guide to African Mammals — refers to humans as “deaf-mutes” in the world of animals’ sense of smell and scent. Though humans’ olfactory capacities may be more limited, they are richer than many of us recognize. We, too, it seems are creatures of scent and smell, urge and impulse. The animals are massive and the scent unleashes the herd mob. Soon, they are a stone’s throw away, mad with instinct, tons of flesh distributed across hundreds. Their traffic is sudden and furious, unsettling then, even later, on return to the vehicle. How a thin whisp of scent can stir animals into such madness. 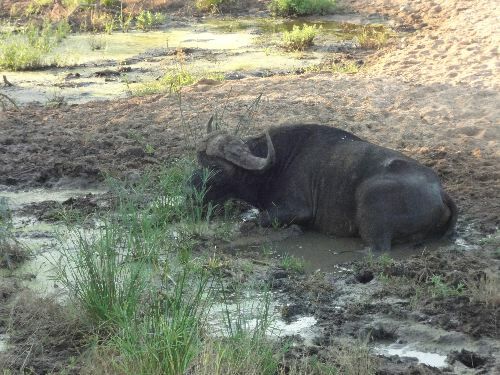 The water buffalo looks somewhat like the American bison, the same broad, steady build, but with the handlebar mustache horn atop its head. 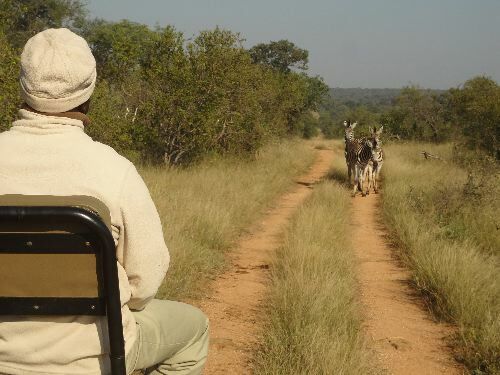 It is a no-drive area, and so the ranger loads the gun with bullets and a line is made, single file. Approaching one direction and another, trying to avoid the wind’s whims. It betrays, and the herd is alerted to the scent and presence. * The disease-carrying tse tse fly is attracted to brown but not to black and white patterns. Disproven. * The pattern provides a sophisticated heating and cooling system, the black absorbing the heat and the white reflecting it. Demonstrated incorrect. 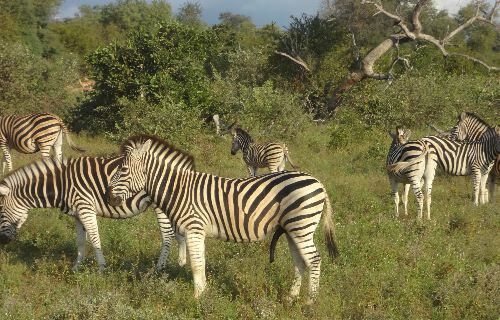 * Scientists now believe that the stripes provide a tracking system, signaling the zebra’s movement to other zebras, much as with the warthog’s erect tail, the color highlighted behind the giraffe’s ears. Beastly, untamed — a most natural thing. 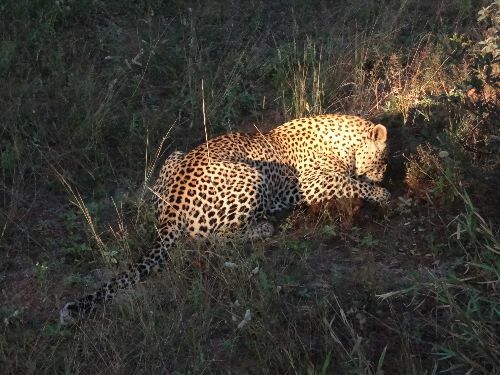 The leopard, sighted three times now, lays down to bite obsessively at an injured paw. It’s not injury, though, but the scent of a female that he gnaws at restlessly. Spraying regularly to mark his territory, trying to encircle, to engulf, to swallow down the essence of her while sending his chemical signal of availability. Electric, awakening energy, raw and essential and close to life, its marking and rubbing and bucking and limping. The pulse of life as it charges through the body, not thought but felt, demanding to have something made of it — new life, or, transubstantiated, words. 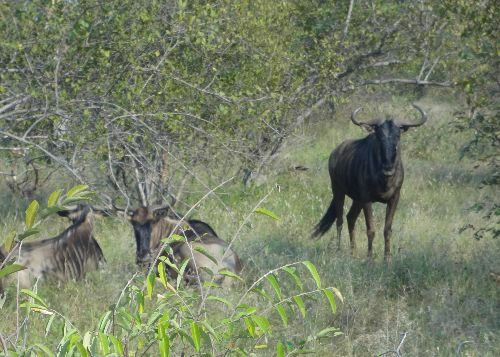 A few weeks back, they say, a pack of dogs attacks a gnu, not far from the vehicle. Cats cut at the throat of an animal; the honey badger attacks the testicles. Wild dogs are a natural machine, tearing an animal to get at whatever is available. One carries away a leg, another a chunk of torso. Within a minute’s time, the pack devours the gnu, piecing it apart. To pet, to own, to shelter, to cuddle, to smother with our own sensibilities. And also to analyze the thing until it is no longer its own thing, to piece it apart and break it down until it can, it must, digest in the juices of sense-making. Subject to thought, what hope does a thing have of remaining whole. Whom will I have to tell my stories to, and whom will you? 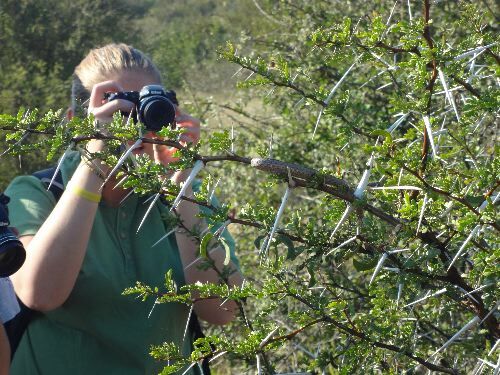 A juvenile boomslang, most poisonous snake in these parts, suns among the spines of the thorn tree. Some venoms work on the flesh, causing necrosis; others attack the nerves. 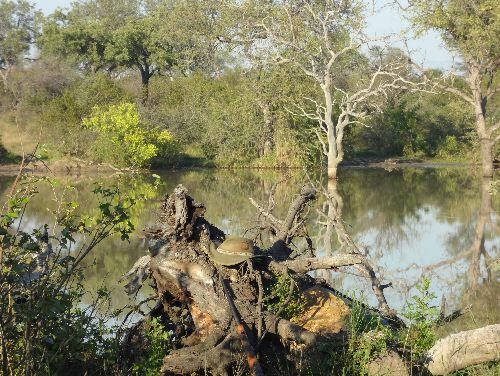 The boomslang’s venom thins the blood; its victim bleeds and bleeds. So, tell me, is desire more the venom or the anti-venom? Does it upset the order of things, or does it temper those old injuries that bleed from us. A stirring of the blood, a chance coagulation of spirit. Pain hollows out like the inside of a carved bull’s horn, and there is a hunger not to be as alone as we all are. Looking for leopard one day, finding cheetah instead — this is the way of things. 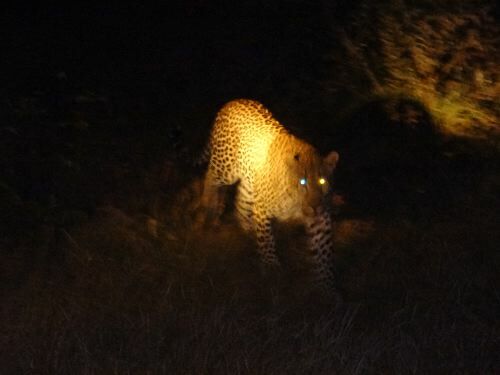 A rare find, just 300 cheetah in Kruger Park last census. Their arrival in this part is welcome, as it is hoped that they will establish a territory and build a population. Mobility is imperative among animal populations — things are never settled and only very briefly still. Born, grow, traverse, mark, defend, mate, move, and, even in death, recycled — consumed and transported, made into the energy of another form. 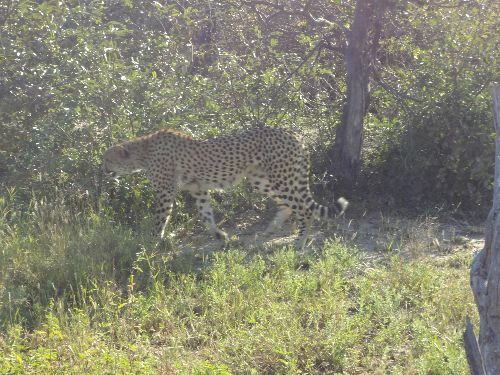 Eventually, despite the seasoned tracker, the cheetah eludes, lost to the bush. How soon things upended return to the routine of how they were (sort of). Rhythms fall back on themselves and the liminal moments at the edge of night and day, when wit stands aside, dissipate. 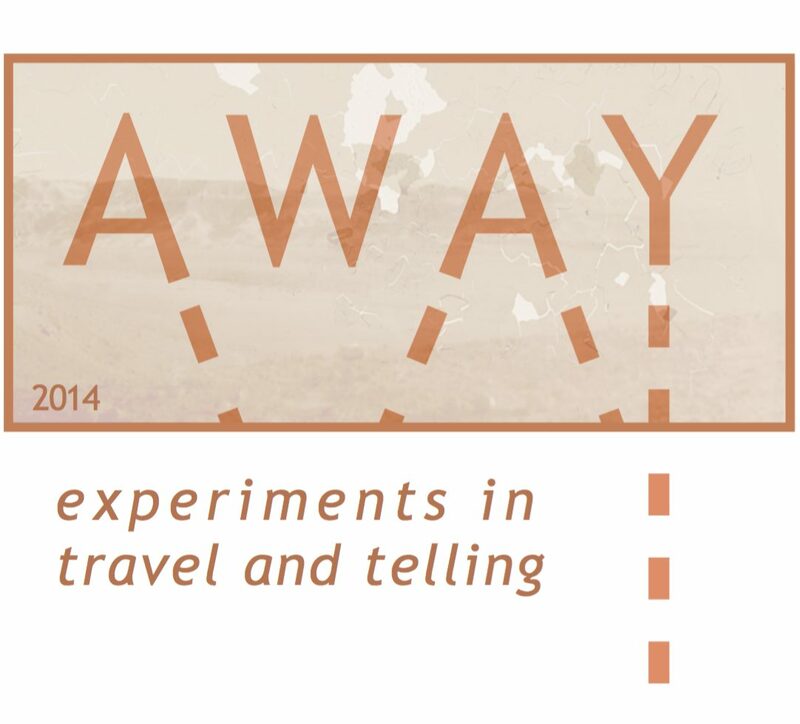 Going away is about coming back again, seeing what had not been evident. A living room — books, colors, furnishings — what kind of person lives here, reads these, makes a life in this place? A world more made than the tired mash pot of its observer. Coming through immigration: “What is your profession? Your purposes? How much money do you carry? And what have you brought back?” “A professor, study abroad, $200 I think, a few curios and some bags of macadamia,” stated directly, not telling the half of it. At customs, a dozen or so Americans stand aside an office, waiting for their guns — big game hunters. 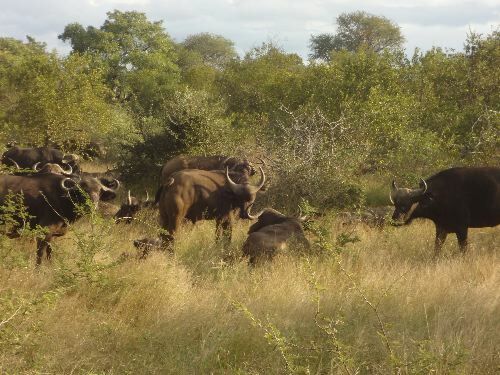 “I have plenty of impala. I came for big cats — leopard, lion.” A small portion of South Africa’s tourists, Americans make up most of the area’s visiting game hunters. Some folks are made “sick” by this; others understand it as contributing to conservation. Big game hunters all of us, in a way (Americans in particular). The animal sniffs and scratches and shits and fucks and marks and slinks through the night. We feel it rise and will not have it, and so — the fence, the chain, the edutainment routine. How much more, even, to own it (as though we could), to confront its expansive being with our sense of the way of things, our order, a living room we call home. Pull the trigger, click the shutter, scribble the word, extinguishing the almighty aliveness, trying to remind ourselves it ever existed in the first place — the photo, the journal, the trophy. Donna Scheidt is an Assistant Professor of English at High Point University in North Carolina. As a faculty member, she has had the experience of never quite returning home from study abroad trips to South Africa and Swaziland. You can find out more about her and her work at donnascheidt.wordpress.com.